I think many of us have heard that swimming is a sport in which you can participate throughout your entire lifetime. 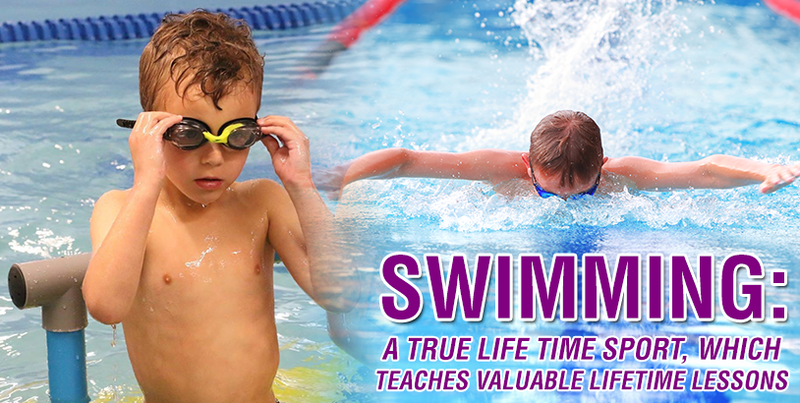 Did you know that swimming also teaches many life lessons that can be used outside of the pool? I know all of you are just beginning your swimming journey, but I felt that it is important to point out not only why swimming is a great sport, but also the value that it brings to everyday living. When you compete in swimming, it is you against the clock. You have to believe you can accomplish whatever goal that you have set because you are individually responsible to get up and perform when it counts. Your support group (family, friends, teammates, and coaches) want the best for you, but they can’t perform for you. More importantly, the preparation and practice that you put in leading up to a competition or race is vital to your success. Only you truly know if you are 100% prepared to give your best effort. Did you skip a practice or two for not a very good reason? Did you train to your best ability each day? Do you believe in the work you have put in? I think the following statement sums it up best. It’s when you reach that breaking point and push past it that you grow and improve. This relates to everything we do. Our students and athletes have the opportunity to show off their swimming skills at our four swim meets throughout the year to prove their hard work. The further along you go in your swimming career, the fewer times you are going to swim your personal best. As a result, when you get to a high school conference or state championship meet or a USA Swimming sponsored championship event, how are you going to handle the pressure and perform? Not every “big” meet or competition is going to go the way you expected. Learning to deal with the mental stress is something you have to learn to handle in order to have a peak performance. Many of us have to deal with this on a daily basis. Swimming can provide the opportunity to learn to deal with high stress situations and how to succeed. Let’s say you get to high-level club swimming or college swimming where you have multiple practices a week, school, and a social life. How do you fit it all in? When your day starts with a 5:00AM practice, followed by a full day of school, and then another practice and you don’t get home until 7 or 8pm, you learn to schedule your time so that you can eat dinner, finish your homework, and have some time to talk with friends. If you struggle with managing your time, one of these areas will start to slide and you will hear about it. Many people are afraid of swimming in the deep water where you can’t see the bottom or see the end of the horizon. Swimming and learning to swim correctly will help alleviate that fear of the unknown. If swimming can teach you to jump into a deep body of water and feel comfortable, then you should be able to tackle many things you may not be 100% comfortable with. Swimming is like riding a bike. Once you learn the basics, you will never forget them. It may take some fine-tuning occasionally. Swimming is one of the best cardiovascular activities out there. It has a very low impact on your joints and your body. It is very easy to increase your heart rate to a point that helps to improve your endurance as well as burn calories. These are just a few of the big life lessons swimming can help provide. Many of your children are beginning to develop these life-long skills. Many have pushed themselves out of their comfort zones and away from the fear of the unknown. They are beginning to learn some time management, as they know they have a swim lesson or practice weekly. If they continue with this great sport, the life lessons learned will become more and more valuable.